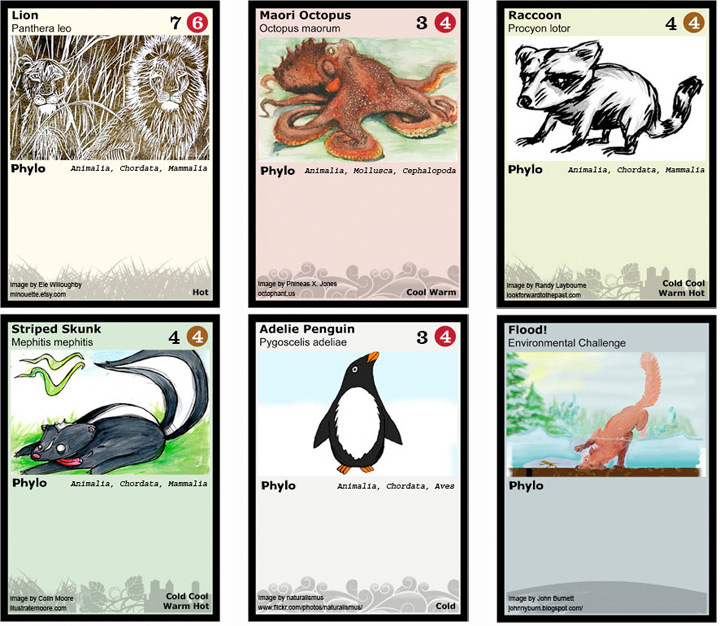 “Last March we wrote about the ecosystem card game Phylo. Then the Phylo team used artwork you submitted to create a new, all-Muse deck. Now it’s time to play: can you survive the game? Download and print the cards below in color (or cut them out of your November/December 2013 issue of Muse). Then download the rules below (or look back to your March 2013 issue). Then start playing! Download the first half of the deck here. This was an interview done with David Ng and Barry Joseph, the Associate Director For Digital Learning, Youth Initiatives, at the American Museum of Natural History. Essentially, they’ve been chatting with each other on a collaboration between the Phylo project and the museum, that will involve pterosaurs (yes, that’s right! These things!). David, How did you ever wind-up leading an on-line, crowd-sourced game development project to teach science? I head a science literacy lab at the University of British Columbia where one of my principle interests is looking at science from interdisciplinary as well as creative perspectives. The Phylo project has a lot of that so it definitely makes sense for my lab to engage in this sort of stuff. Plus, it’s just kind of an awesome idea. As for specifics? Well… it all started because of a bit of serendipity really. I was aware of Andrew Balmford’s paper which compared children’s knowledge of Pokemon to their knowledge of wildlife, and even used this research every now and then as an interesting (and disturbing) factoid in class. At the same time, my lab was also hosting an online science publication called the Science Creative Quarterly, and as a result was enjoying a fair bit of online clout. 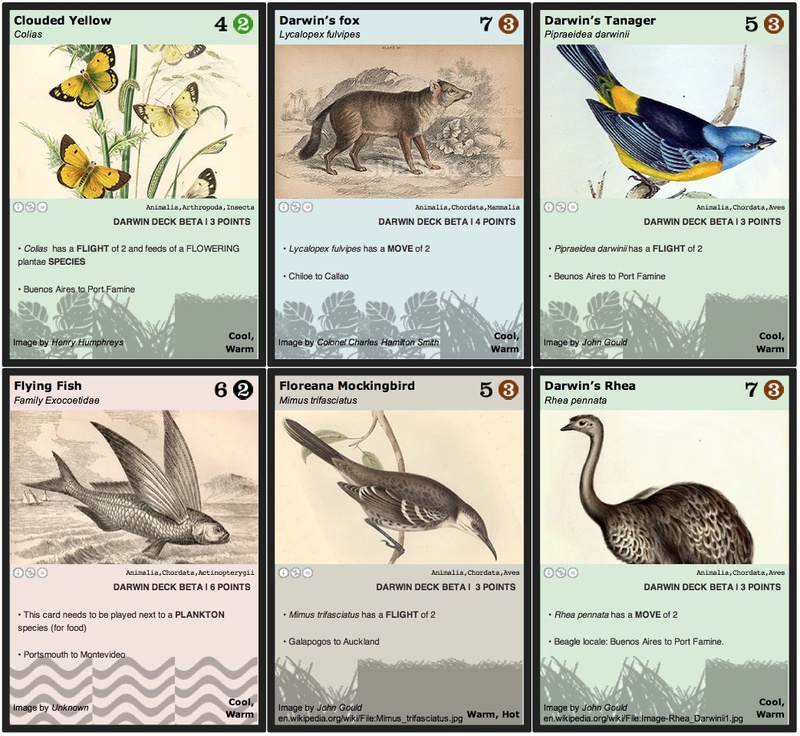 With that web reach, I started wondering if the act of creating a biodiversity trading card culture would be best achieved by relying on online crowdsourcing, especially given the multidisciplinary nature of the task at hand. Anyway, this led to checking up with Andrew for permissions to “have a go” and the rest, as they say, is history. At the beginning, I didn’t necessarily consider myself a “gamer”, but the project has been interesting for so many different reasons that now I do. It turns out that many elements of gaming fit really nicely with my lab’s interests. One of these days, I’d like to look formally at being more involved in research around games. ??????? ?Let’s see… Basically, it’s a trading card game (TCG) that also happens to be freely available. Just go to phylogame.org, and you can download a starter deck to print out and you and a friend can start playing. You can also build your own decks, because the website has been designed to allow you to choose other cards (about 500 are available to date). In many respects, this is similar to other TCG systems, except the collectability element is different (you print your own, as oppose to buying packs). In terms of “how” it is played, maybe the best way to describe it, is to say that it is played a little like dominos. In other words, the game is played by placing species cards on the table and adjacent to each other based on whether a “match” occurs. Unlike dominos, Phylo cards can be connected in four directions (the four sides of the cards) instead of the two ends of a domino piece; and the “match” is achieved by a card having at least one connection to another card with the right habitat (terrain and climate) as well as right energy source (i.e. what it needs to eat or get its energy from). By relying on this, you essentially create a sprawling network of cards that represent various food chains – kind of like an ecosystem. This is how you get points – the larger your networks, a.k.a the more cards you can place on the table, the more points you get. The other element, however, is that there are cards that can modify your opponents’ food chains. The most common example is an “event card”. For example, a “wildfire” card might remove one of your opponents plant card; there’s obviously a loss of points due to the removal of the card, but depending on how strategic this is played, the opponent may now also have an herbivore card with nothing to eat, which in turn could be a problem for the carnivore that relied on that herbivore, and so on. In effect, there could be downstream consequences to this one action which: (1) demonstrates the importance of keystone species, or the strength in redundancies; and (2) illustrates some of the strategic elements of the game itself. Since Phylo was launched, what are some of the activities around it that have interested you the most? This is where things have been really cool, and also totally unexpected. I have to admit that I find this project a bit surreal at times! I would say that our initial goal has been more or less accomplished. In other words, we have figured out a way for sustainable production of freely accessible new cards that appear on the website, and that these cards can be used in enjoyable and educational ways. This seems to be working, although the rate of new cards is a bit sporadic, they’re still appearing so that there’s usually something new to see every week or so. But now one of the most promising aspects of the project concerns the production of high quality cards or high quality decks. In this case, we had a general sense that the “print your own” cards were pretty cool, and even potentially useful (from an educational point of view), but members of the community kept saying that whilst the cards are great, at the end of the day they’re only as good as the printer you use to print them. As a result of this kind of commentary, we had ideas sprout around the possibility of “hosts” sponsoring decks, which in turn could be sold, and therefore could push the production values of the project to a higher level. The exciting thing here is that if this works, then we have a mechanism that further adds new phylo cards, and allows the purchase of high quality cards (where hosts can also control things like rarity). Not only that, this system sets up a way for artists to be paid fairly, as well as provides a mechanism for fund raising for the host involved. Basically, it seemed like a win win situation! The only issue, of course, is that there is an initial investment in making the deck (usually by way of the art commissions). This is why my lab has been active in providing these small grants – i.e. we’ll take that initial risk, at least until we have some data on how the cards perform (so as to make it more likely for groups to front that funding themselves). The ultimate goal here (and this would be so AWESOME) is to consider the question: what if every natural history museum decides to host a deck? What if environmental NGOs want to host a deck? 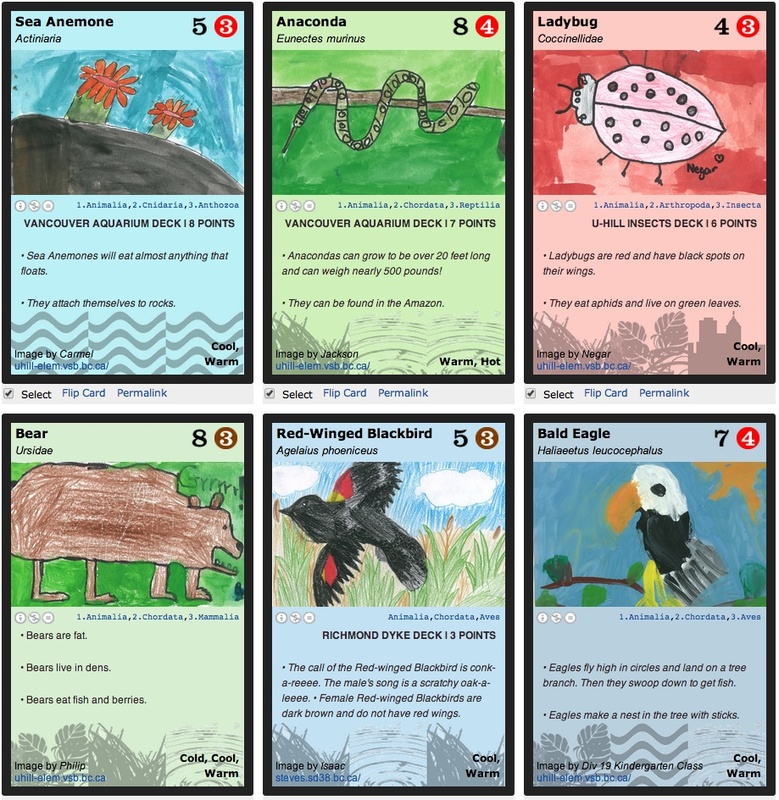 What if wildlife artists want to host a deck? What if scientific groups or organizations want to host a deck? As you can see, it sets up an opportunity where the immensity of biodiversity can truly be reflected by thousands (if not more) cards! And the diversity of the games to be played increases as well. Right! This “hosted” deck idea has now resulted in the design of additional elements that can make the game part more interesting, or at least explore a different facet of biodiversity (not just the main ecosystem building idea). For example, we’re working on a Darwin themed deck right now, and the question there is: how do we incorporate historical elements? We’re also working on a deck that showcases chemicals derived from botanical species, and so that team is asking: how do we introduce that notion, and still make it work with the general game? A dinosaur deck could tackle the question of extinct creatures, or organisms that have a very specific temporal factor involved. Then, there are deck ideas that are less about environmental literacy, but more about using biodiversity as a general source of inspiration, and these decks are different because of some logistic involved. For instance, how would a fancy deck look if the art was produced by children? What about a deck that tries to link species with a famous animal protagonist in works of literature? What if a deck was hosted by a publishing house known for having animals on its covers? How about a deck supported by a biotech firm whose products are predominantly derived from certain organisms? It’s kind of crazy, but my point here is that the fluid nature of the project is resulting in all sorts of different ideas surfacing. Not the least of which is an idea being pursued by the Amercian Museum of Natural History – i.e. what if a host decides to host a children’s workshop that is charged with designing a deck, so that the final deck is actually only a small bookend to a rich educational experience? What does it cost for an institution to have to consider making their own Trading Card Game? Essentially, the grants I’ve been offering are usually around the $5000 mark. This entails art commissions for 25 pieces at $200 each. It’s hard to say how long a deck will take to make, because it depends a lot on existing factors. – Does the institution already have deep knowledge on what that deck makeup will be, or will it take a long time to research what that list of 25 cards will be? – Will the deck be a conventional ecosystem game (we have some basic pointers on what the cards should be to make it work relatively well), or will it highlight something a bit novel (in which case, a new mechanic may need to be looked at)? – Does the institution already have an existing collection of art, or an in house art department where the procurement of graphics is relatively straight forward? – How does the institution plan on distributing the deck? – Does this include a mechanism to generate revenue, in which case legality tends to be more complex and involve other departments in the museum? Regardless of the specifics, my lab is there to help in any way possible – usually this includes volunteering to playtest the species list to see how it works (we do this with undergrads, but also with kids coming through my lab for various events/activities). So far, we have two (almost three) fancy decks ready – one took over a year, whilst the other took about 3 months. The third took about 6 months, but involved an art competition element as well. Also note, that another option is to work on “booster sets” instead of full starter deck – i.e. let’s make a small set of cards that can be added to the system for extra gaming flavour, primarily to tackle specific outreach or learning objectives. It is hard enough to design a game that is fun, but you also want a game that can teach science. How do you know if the game is having an effect as an educational tool? This is a key question. For a while, I’ve been aware (anecdotally) that folks (young and old) think that the project is pretty “cool.” However, I really have no idea how “useful” it is – are people actually learning stuff when they play, and maybe more importantly, are they learning it better than other means? This would be very interesting information to have. Consequently, my lab is also keen to embed the project more fully into the educational spheres. This was actually why the DIY card section was added about a year ago – it opened up a possibility of decks being prepared by anyone with access (say a teacher or students in a class), which in turns provided the option of “classroom decks.” We’ve piloted a few of these, with much success, but I should add that this again is anecdotal success. I’m hoping in the next year or two to court a collaboration where we can have some proper research done on this matter. I even have a small pocket of funding to help this facet along if any readers are interested (say education graduate students looking for an interesting project). A sampling of some of amazing DIY cards produced by children. You are not a game designer, and most museums don’t have one on staff. So how are the games getting “balanced” so they are both engaging to play and educational? I think the project is doing a pretty good job on making sure the game is fun to play. This is attributed to the passion of the gaming community who really picked apart the game mechanics, especially in the early stages of the project. As an example of how immersed they were with the project, a week after the first rules were posted someone then went on to post a ten page critique, saying how those rules were flawed. He did this by outlining an unbeatable deck! From there, the rules have been playtested extensively at gaming conference, scifi conferences, etc., until we arrived at the version of rules that we currently ship with the fancy decks. I guess this is the beauty of crowdsourcing, especially when there is also the luxury of having a project that is not so business minded, but more idea driven – we didn’t need a perfect game right from the start, but we have managed to create a pretty awesome set of rules over the course of the project. In terms of balancing the educational piece, it would appear to have some educational value as teachers tend to like it, and the kids in class as well, but as mentioned above, the scientist in me is deferring this question by saying that technically we don’t have any strong evidence for this yet (although I would love to find out). When the real world is simulated within a game, decisions have to be made. How does Phylo balance game play versus the reality behind the scientific content? This is another good question, and there are two issues that have come up with Phylo. First is at a very philosophical level: How important is it to be scientifically literate all the time? This question can take the form of “Can the art be cartoony?” “What about a game where someone has figured out how to combine Phylo cards with Pokemon cards?” For this angle, we’ve decided to be accepting of pretty much anything as long as it doesn’t overtly try to pass pseudoscience off as real science. I think we can do this, because as mentioned before, this isn’t a business proposition where we’re tied to focusing our efforts on one strategic possibility. Still this acceptance of breadth is challenging for different reasons: For instance, because the project is from crowdsourced activity, we need to have enough people to participate so that all levels of scientific literacy can be entertained. In other words, if we have a big enough community involved, then maybe we can have groups focused on a cartoony deck, but also have another group working on the photo (ultra realistic) deck too. Then, there is scientific literacy issues simply due to trying to translate the whole of biodiversity into a game mechanic. In short, this isn’t easy because a game mechanic thrives on simple intuitive rules. Unfortunately, biodiversity is anything but simple, and often it’s actually very complex. As a result, the rules focus on very simple attributes of the organism (it’s name, what habitat it likes, where it gets its energy from, and whether it can move). Still, even with these simple parameters in place, there are occasions where things can happen “in the game” that would never happen “in real life.” For example, according to the rules of the game, a polar bear card might feed on a penguin card. Biologically, this is actually doable, but in the real world they are found in different parts of the planet. Because of things like this, there exist small “hacks” in the rules: for instance, the “call your bluff” rule. Here, if the rules say it is okay (to play a card), but the reality would suggest that such a thing would never happen (like the Polar Bear example), then you can do a Scrabble-like “calling it” mechanic where the validity of the card placement can be tested. 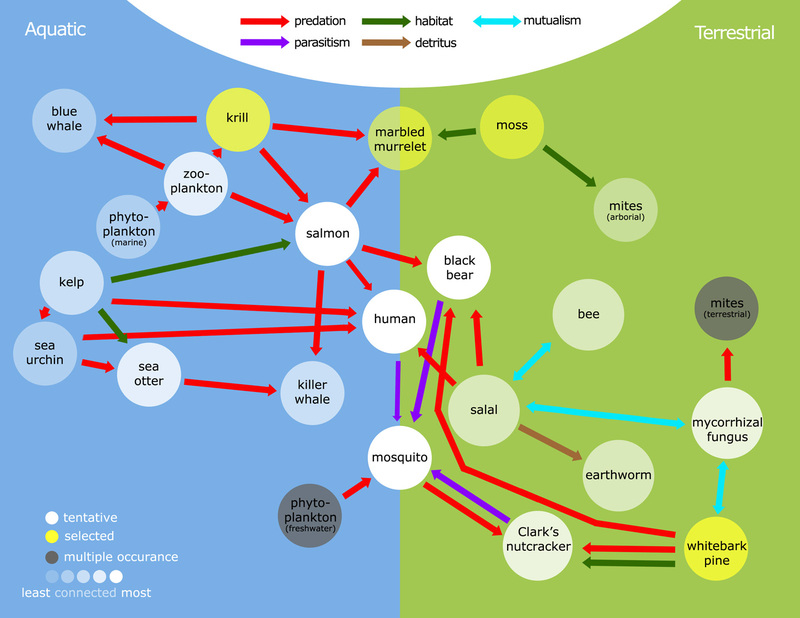 In our deck with the Beaty Museum, a handy dandy food chain connection chart is available for this very purpose. What does that mean that you crowdsourced Phylo? What does that look like, and why did you take that route? I’ve thought a lot about crowdsourcing over the last two years (I’ve even given the odd talk on the subject: Things I Learnt from my (Unscientific) Experiences with Crowdsourcing). Crowdsourcing, technically, is a term that describes a kind of outsourcing of tasks, where informal, undefined groups of people participate, and usually with incentives that are outside of traditional means (for instance, payment, accreditation). In other words, it’s a way to galvanize a community (or many communities) towards a project that they simply believe in, and in doing so, you hope the community is large enough that many small acts of contribution can lead to a greater whole. For this project, crowdsourcing was utilized primarily for pragmatic reasons. 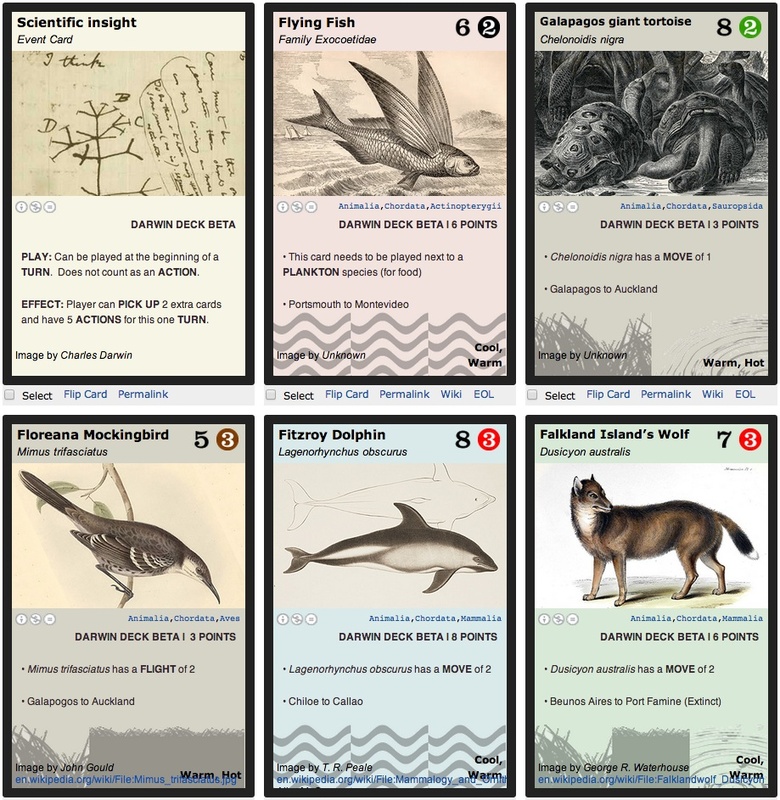 To create an amazing biodiversity trading card culture under conventional conditions would simply be an intensive, all consuming, cost-prohibitive, and frankly unrealistic endeavour for a small lab. It would require expertise from many different areas, including biodiversity science, visual art, gaming, website design, computer programming, and education. As well, hindsight has told me that help also came from unexpected and unforeseen areas: folks knowledgeable in publishing, intellectual property, and museum culture have really stepped up and contributed significantly. That sounds great but there must be problems with crowdsourcing, no? Yes, lots. A big one is uptake. By definition you need “groups” of people to participate. The larger the group the greater your reach and potential contact with the skill sets you need. But getting this reach isn’t a sure thing. We had help, in that we had the relatively good traffic of the Science Creative Quarterly on our side. Just as important, the SCQ afforded us strong connections with the rest of the science blogging community at large. In particular, we had a strong support from Cory Doctorow at Boing Boing, and he promoted the project during its early stages. It’s hard to second guess, but I think having this initial digital influence on our side was very important, at least for getting the ball rolling. Another example is the exploration of cards in high quality form – in other words, the whole angle where art can be commissioned (as opposed to relying on donations) towards the production of a purchasable physical deck. The ideation for this was strategized by the community, but actually getting it to go required a champion (a host, say a museum or other group, that would be interested in creating their own special deck) to invest in the art commissions. In the end, my lab decided to step in, and see if we can offer grants to pilot this possibility. The intent here is to see how this might work with less risk to the participant given that my lab will front the funding. This works for the project, because this type of funding is realistic for my small lab, and also worth it because we hope to gain data on the relative merits or dangers of such an investment. The end effect is to assess whether future hosts might feel confident that their own investment is worth it afterall. If it is, then this is where the project might explode with many new independent decks appearing. One final example I can offer about the disadvantages of crowdsourcing is that because your incentives are less formal, you don’t really have a lot of control over outcomes. For instance, there might be something that just needs to be done, and it isn’t necessarily onerous from a time or resource perspective, but for whatever reason it doesn’t strike a chord with anyone in the community. Editing the write up for the rules comes to mind with this issue – it’s been made clear that this is not easy to do well (the writing of the rules always sound way more complicated than when you play the game itself), and I still think the written rules continue to need more work done. Finally, in terms of crowdsourcing nuances, I should point out that there was a lot of activity at the beginning, when things were being sorted out and developed. There’s definitely less action these days from a crowdsourcing perspective, if monitoring the forums are any indication. A lot of the newer directions tend to be host deck specific, but I think that makes a lot of sense – the main nuts and bolts of the project seem to have been worked out. Nowadays, efforts are primarily revolved around one high quality deck at a time.